Magical Bridge was designed from the ground up to be enjoyed by people with physical limitations, people with cognitive impairments — and people who are not disabled. Villarreal says Magical Bridge is not a “special needs” playground but welcomes everyone in order to encourage different kinds of people to get comfortable with one another. It features a two-story tree house and stage that is fully accessible by wheelchair, auditory and sensory equipment, a spinning zone — and all of the swings are Ava-friendly. 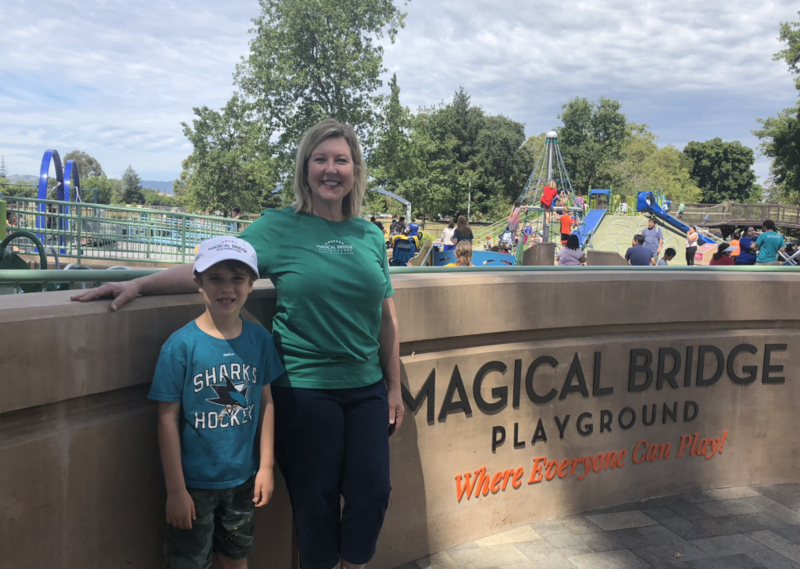 The Magical Bridge Foundation is now building playgrounds in more parks in the Bay Area and Villarreal has started thinking about how to bring inclusivity to school playgrounds as well. EdSource sat down with Villarreal earlier this month at Magical Bridge in Palo Alto. Below are excerpts from the interview. Q. Why are inclusive playgrounds important — in the community and in schools? A. One in every 5 members of our community has a visible or invisible disability, including aging people and the visually impaired. Playgrounds are so important for making connections but many people are excluded from them for a variety of reasons. For instance, 1 in 45 kids are autistic and they can find the “usual” style of playground chaotic and overwhelming. These kids benefit from a more predictable layout where the play experiences are lumped together — swinging in one area and spinning in another, plus retreat areas where they can go for quiet. And kids in wheelchairs or with mobility limitations often can’t do anything but sit there and watch other kids play, even though their friends want to play with them. Q. Doesn’t the Americans with Disabilities Act (ADA) already require that playgrounds be accessible? A. Let’s put it this way: the ADA was a good start. But when the ADA passed [in 1990 and subsequently updated], playgrounds became limited in their innovation: “Check the box, we are ADA compliant.” There was the notion that students with disabilities should be able to access the equipment. But accessing it is not the same as being able to use it — as being included. Commonly used surfaces such as bark and sand cannot be easily traversed by a wheelchair. Some playgrounds will have a ramp to the playground, but then there may be raised borders or different levels on the equipment so that it is actually inaccessible. Playgrounds have not been places where you see everyone that lives in your community. Q. If school and district leaders want to make playgrounds usable by more students where should they start? A. Start with the understanding that “ADA compliant” is not good enough. Everything you have could be in compliance but look around at recess: Who is being left out? Children’s development comes from moving. If you’re the child that has a limitation you’re not benefiting from play like you could be if you can’t use the equipment. So your developmental milestones may not be getting addressed. Much of it is common sense. Be mindful of surfaces like bark and lips around the playground. Existing school playgrounds are in need of an overhaul. They’ve been stuck with the same model for too long. Magical Bridge is developing a pilot program to create inclusive playgrounds that could be easily adopted. We’re in the early design stages and working with educators. The idea is that, with our partners, we will offer pieces of inclusive equipment and explanations about how they can be used. Schools will be able to find standalone pieces that can add value. Or create zones or modules, such as a retreat area or spinning zone. So they don’t have to start from scratch like I did. Q. What about the cost? Creating new playgrounds is expensive and may be unrealistic for cash-strapped schools. A. We partner with local businesses, city officials, foundations and the whole community to raise funds for our playgrounds. We have teamed up with local schools such as Mountain View, Morgan Hill and Sunnyvale to hold “coin drives,” where students contributed change to help build inclusive playgrounds in their communities. But throwing money at the problem is not always the solution. I know of a playground that was recently created that cost $10,000,000 and is not accessible. It’s about being mindful about ensuring that everybody can come. In addition, a very large component of Magical Bridge’s success is the programming. There are grants that have supported science and music programs at the playground and we have a program to enlist local teens as “kindness ambassadors” at the playground. It starts with a change in how you think about playgrounds — we need to think of them as whole-community gathering places again. Wonderful article. Learning more about magical playground left me feeling inspired. I can truly see idea of having inclusive play spaces like magical playground becoming a reality statewide. Yes! Whole Child/Whole Community education promotes equity by focusing on giving each child what he or she most needs. When we address the needs of all children and approach the work by including all children, we address both equity and empathy. Teaching children that differences and learning differently are normal creates the foundation for advancing a more civil, inclusive, just, and humane society.